To help stem the decline of pollinators it is recommended that gardeners cut back on pesticide use, create nectar-filled gardens and provide and protect nesting sites. Home gardeners should if possible, plant native wildflowers adapted to local/regional soil and climatic conditions. These and other small steps you can take in your yard can make a big difference for bees, butterflies, hummingbirds and other pollinators. 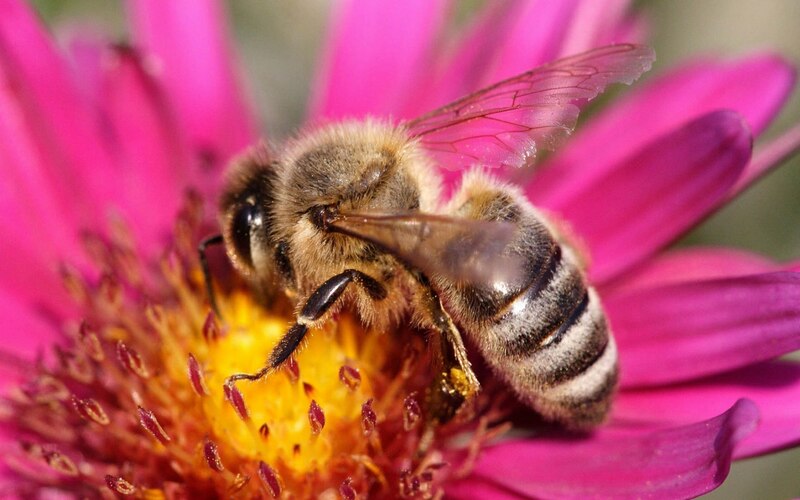 You don’t need lots of money and time to help bees, butterflies and other pollinators. One way you can assist them is simply by planting a few flowers. The key, expert say, is choosing varieties that have lots of nectar and pollen. Go to the local nursery and look at the regional plant list. You can plant non native flowers, but many hybrid flowers have a nice scent and look attractive but when the bees go down they don’t find nectar or pollen. You don’t have to plant acres of seedlings, even a small border, a few pots or window boxes are helpful. Just plant as many different kinds of flowers as possible to provide a succession of blooms from early spring until fall. Any small effort is worthwhile especially if you join in with your neighbors because although small native bees have shorter flights and won’t go far, honeybees, bumblebees and carpenter bees are strong fliers and will fly miles in search of nectar and pollen. They will cross over from patch to patch. If you already have a vegetable garden, introduce some tall plants to attract and slow down pollinators. Sunflowers (Helianthus and Tithonia) are good choices, as are climbing varieties such as morning glories, scarlet runner beans, red kidney beans, yellow and purple French beans, garden peas, sweet peas, and nasturtiums. Grow them up a fence, trellis or bamboo poles. Bees will also visit plants that require cross pollination such as cucumbers, squash, blueberries, pumpkins, melons, tomatoes, peppers and eggplants. Once you’ve provided a pollinator garden make sure you maintain a safe haven for pollinators. Practice organic gardening methods or use pesticides (preferably botanical and biological) only when crucial and then in selective, small ways and always after sundown when the pollinators have retired for the night. Don’t spray directly on the blossoms or use systemics, which travel throughout the entire plant. And it’s wise not to use dust pesticides, which cling to hairy pollinators and are carried back to their nests. It’s better to hand pick or spray bugs with insecticidal soap, or hose them off with a stream of water. Don’t use herbicides and insecticides on your lawn or water it deeply – these practices can poison or drown ground nesting pollinators. It’s also important to create a source of food for young pollinators and provide over-wintering places for eggs and larvae. To do so, allow a corner of your backyard to naturalize with wild grasses, weeds and wildflowers (including Queen Anne’s lace, thistles, burdock, borage, milkweeds, evening primrose) and plant extra dill, parsley, and carrots, which swallowtail butterfly larvae consume in quantity. During hot, dry summer months provide water in very shallow birdbaths or pools where pollinators can easily alight around the edges to sip. And because some wasps and bees use mud to build their nests and butterflies also like to congregate in muddy puddles, allow a hose or faucet to drip. If you have no garden but would still like to pitch in you can create window box gardens or plant in containers on balconies, stoops or rooftops. This entry was posted in Bees and Blooms, Gardening. Bookmark the permalink. Post a comment or leave a trackback: Trackback URL.